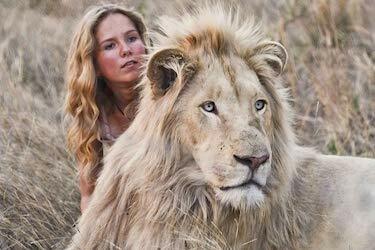 This movie is this generation’s Born Free film about the plight of lions and the threat to their existence. 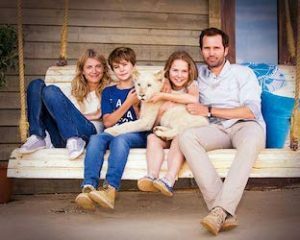 In this case, a family moves from London to South Africa to oversee and maintain an animal farm where they raise lions for conservation. Well, that is what the children believe. Mia and the White Lion is an interesting and educational film about one young girl’s attachment to a lion and her insistence that the lion should be free. Mia (Daniah De Villiers) is not happy about leaving her friends in London to move to a lion farm in South Africa with her family. She is sullen and isn’t interested in the animals, unlike her brother Mick (Ryan Mac Lennan) who adores the animals. 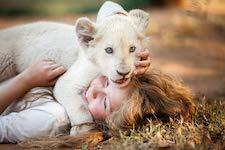 One day Mia is taken aback by the birth of a rare white lion cub. Initially she isn’t interested in the cub, but Charlie wins her over and soon they are best friends. Months and years go by and Charlie grows from a cuddly cub into an adult lion, but Mia insists he will never hurt her. Actually, on many occasions he comes to her rescue and the pair are almost inseparable, to the dismay of her parents. But Mia says she will never give up Charlie. They are best friends, even though he is now a fully-grown lion, and as Mia is told, he is a wild animal. But she knows he would never hurt her. Never. When Mia learns what her father (Langley Kirkwood) has in mind for Charlie, she decides to sneak him out of the compound and take him on a long journey to a reserve where he will be able to live a free life and where no hunters will ever shoot him. What Mia has discovered is that her father sells the adult lions to trophy hunters who are ruthless when killing these magnificent animals. There is no way Mia wants any of their lions to end up as trophies, and especially her beloved best friend Charlie. So, off they go into the wild toward the reserve, encountering obstacles along the way, but steadfast in their journey to make it to freedom. While there are many scenes of horror and sadness (trophy hunting is legal in many areas), the movie does leave viewers with a happy heart. And it will hopefully inspire people to join in the effort to save these magnificent creatures. Lions in the wild are endangered, and their danger comes from man, not other animals. Greed and pure evil has put these beautiful animals on the endangered species list and their numbers are falling dramatically. This film is meant to bring their plight to the masses. And it does so in a sweet way with one girl whose love of Charlie transcends any fears and threats. 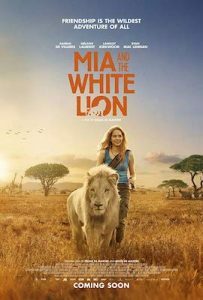 Mia and the White Lion is definitely worth watching by the entire family and after the film families will want to gather together to discuss the film and the plight of the lions and other animals. After all, it is up to mankind to save many of these wonderful and endangered species. Mia and the White Lion is rated PG for thematic elements, peril, and some language. It is both a heart wrenching and a heart warming film. The film opens in theaters April 12, 2019. To get involved helping the lions, visit https://kevinrichardsonfoundation.org.